DESCRIPTION Novelty gargoyle ceramic tile design fitted with a large round magnet on the reverse. 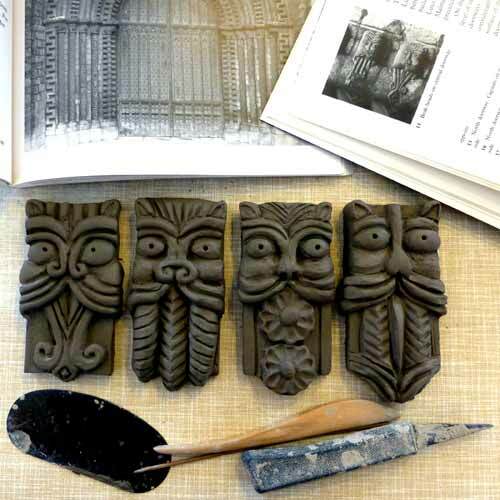 The pieces are inspired by the funny little beak-head stone motifs on the doorway of Lincoln Cathedral. The powerful magnet is a large 3cm diameter disc held securely in place with epoxy glue. These little hand made designs are also frost proof and water resistant and can be used safely outdoors in a mosaic or cemented into a water feature. This design is also available without the magnet and with two small holes at the top, so that it can be used as a little hanging plaque. PLEASE NOTE Price includes 1st class P&P for small parcels to the UK mainland. Medium parcels go by signed for service to the UK and Europe and by Airsure service to the rest of the world. Large parcels go by private tracked and signed carrier services. Please request quote for all other areas. Discount is always given for multiple orders. The item you receive will be very similar, but not necessarily the one shown. Due to the hand-made nature of the pieces there may be slight variations in size, pattern and colour, but be reassured that we only send out the finest examples. This item maybe available for quick purchase from our Ebay and Etsy shops by clicking the links below.